The mission of this group is to discuss and prepare proposal(s) for extending Schema.org schema for the improved representation of digital and physical archives and their contents. The goal being focused upon the creation and future maintenance of an archive.schema.org extension. Note: Community Groups are proposed and run by the community. Although W3C hosts these conversations, the groups do not necessarily represent the views of the W3C Membership or staff. Chairs, when logged in, may publish draft and final reports. Please see report requirements. After the inevitable period of [northern hemisphere] summer inactivity when it seems at least 50% of the participants of these discussions are focussed on vacations, its time to review where we are. Following the release of Schema.org v3.3 timing is right to submit a proposal for archives to hopefully find its way into the next release. Currently we have two proposals on the table. An initial proposal put forward by me and an alternative proposal put forward by Owen. In the initial proposal I suggested two specific types (ArchiveCollection & ArchiveItem) to cater for these conceptually different cases. In the alternative proposal Owen suggested a single ArchiveComponent type to be used in conjunction with other existing Schema.org types, such as Collection, CreativeWork, etc., to achieve the same ends. Much discussion took place on the mailing list around these proposals. It was clear from that, that there are circumstances where it is not clear from current data in an archive as to if an item is an individual item, or a collection of items, or a collection of one item. In such situations it would be difficult to decide which of the two types (in my initial proposal) to apply. Whereas using the alternative proposal no such choice is necessary. Both proposals make use of Schema.org’s multi-type entity capabilities (the ability to define an entity (Thing) to be of more than one type). However it is fundamental to the alternative proposal. This feature may need some explanation and clarification in supporting documentation and examples, but should not prevent the proposal going forward. A parallel and connected proposal is for the introduction of a materialExtent property, which has relevance for CreativeWork in general, and associated collectionSize property for the Collection type. I suggest this should be submitted at the same time. Following an active and interesting discussion at the LODLAM Summit 2017 (notes from the session here) I have made some small tweaks to the proposed model. This is an inverse property to the archiveHeld property of Archive. Although the Schema.org community does not encourage inverse properties I believe we may have good pragmatic case here where the use-cases could include an Archive holding a significant number of collections which would preclude their individual listing on the Archive type. Confirmed that itemLocation is a property of ArchiveItem and replaces the originally proposed use of location. I have updated the model diagram and examples on the proposal page in the wiki to reflect these changes. They have also been reflected in the Archive prototype Schema.org instance. If people are happy with these changes, I suggest we move to proposing this initial extension to the broader Schema.org community. I have had some people indicate that if it was accepted they would be prepared to look at implementing it in systems to which they have access/influence. Such support always helps with the submission of proposals to Schema.org, please let me know if a) You could make such a commitment and b) if you would want that to be known publicly or not. Following discussions on the mailing list and taking into account general evolution of the schema.org vocabulary over recent months, I have produced an updated version of the straw man initial proposal in the Wiki. This version is somewhat simplified when compared with its predecessor. The objective being to approach a minimum viable proposal for sharing information about archives and their resources to aid discovery on the Web. It includes a worked through examples of an item in an archive, showing the overall data model plus examples of data in JSON-LD form that could be inserted into the individual html pages for the Archive, ArchiveCollection, and ArchiveItem. The prototype working example site for Schema.org including the proposed extension has been updated to reflect these changes: archive.sdo-archive.appspot.com. I look forward to continued discussion, moving us forward towards drafting an agreed proposal to the main Schema.org community. It has been some time since this group was formed to focus on applying the Schema.org vocabulary to archive data. There was an initial flurry of activity but that was followed a period of inactivity. I believe now is a good time to review, especially for new group members, our initial objective and the initial progress we made; update where we are; and hopefully refresh our activities. 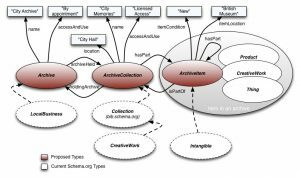 The group was formed following interest, expressed at the LODLAM Summit is Sydney 2015, in following the example of the Schema Bib Extend community in proposing enhancements to the Schema.org vocabulary and sharing best practice examples of its use. The objective, in using schema.org to share data about archives, being to make them more discoverable across the web, not to replace any other standards. 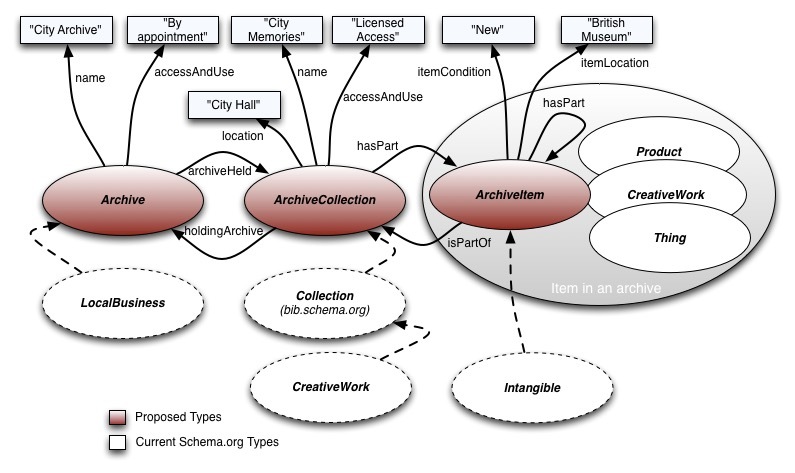 Schema.org being used to describe archive organisations, archives, and their contents, location, and access, to the wider world. After some early discussion I posted a straw man proposal that addressed some of those issues. This model builds on already available types, properties and patterns within Schema. Although some discussion followed, it did not result in a concrete proposal being agreed. Part of the reason for this I believe was the lack of participants in a position to apply and share the proposals. Recently I have noticed an increase in new members as well as having had some new discussion on the mailing list. To that end I think and hope it is time to wake things up again. Upcoming in June 2017 is the next LODLAM Summit in Venice . I intend to propose a discussion there to spread awareness and gain engagement to take things forward. If you are attending, or are in contact with other delegates who are please participate. Although the Architypes home page is the entry into our community site most of our efforts will be visible in the Wiki. If you want to see what is going on, this is the place to start. Welcome. The assumption being that you are here because you are passionate about archives digital, physical, or both, and how to describe them and their contents in a way that can be easily consumed by search engines and others. Using structured data ontologies and vocabularies to describe archives and their contents is nothing new, but these approaches are often targeted for use by software and professionals in the archives community. The intention of additionally using the Schema.org vocabulary is to make those descriptions more readily understandable and discoverable in the wider world, leading to more discoverable archives. The purpose of this group is to identify how the Schema.org vocabulary, and its extensions, can be utilised to describe archives and their contents. It is clear that there will be need for some new or enhanced types and properties to provide adequate descriptive capability for generally sharing information about an archive. Hopefully we can form a consensus around a set of these that can become a proposal for an archive.schema.org extension to the core Schema.org vocabulary. The physical location of items in an archive/collection – in a folder, in a box, on a shelf, in a room – or in a file, in a directory, on a disc, on a server. The relationship between items – by date, subject, collector, creator, etc. Item types that are often in archives that cannot be currently described using Schema.org – candidates for discussion could include a letter or a diary. In the near future I will add proposals into the wiki that have already been suggested from other areas that will give us a start on 2 & 3. Meanwhile spread the word and invite others to join this group, start the conversation in the public mailing list, or if you have proposal suggestions add them to the wiki. The mission of this group is to discuss and prepare proposal(s) for extending Schema.org schema for the improved representation of digital and physical archives and their contents. The goal being focused upon the creation and future maintenance of an archive.schema.org extension. In order to join the group, you will need a W3C account. Please note, however, that W3C Membership is not required to join a Community Group. This is a community initiative. This group was originally proposed on 2015-07-06 by Richard Wallis. The following people supported its creation: Richard Wallis, Geoff Browell, Danny Archer, Peter Neish, Zoe D'Arcy, Terry Jolliffe. W3C’s hosting of this group does not imply endorsement of the activities. The group must now choose a chair. Read more about how to get started in a new group and good practice for running a group. We invite you to share news of this new group in social media and other channels. Learn about available Community Group tools and how to configure a group's site to include links to tools on w3.org or elsewhere.